Image editing software like Photoshop ( ) allows you to heavily alter an image in incredibly realistic ways. One of the most common ways an image is altered is to improve the look of skin. Glance over a magazine rack and you’ll see a vast gallery of faces that, whether you can tell or not, have been heavily manipulated. Portraiture 2.0 is a Photoshop plug-in that makes professional-quality portrait retouching a simple job for anyone with a copy of Photoshop or Photoshop Elements ( ). While good lighting, makeup, and skillful camera work is still essential for good portraits, Portraiture 2.0 will add that last bit of professional oomph to your images. In the old days, photographers improved the look of skin by shooting their subjects through gauzy material, which served to smooth out skin texture into silky tones. Portraiture provides a digital equivalent of this same smoothing. While you can approximate this effect in Photoshop by employing carefully constructed localized blurs, Portraiture is a much easier solution. It automatically knows that it shouldn’t blur important details such as hair, eyelashes, eyebrows, teeth, and lips, and it can still correctly identify skin tones and then hit them with a realistic smoothing. One of the nicest things about Portraiture is that it’s smart enough to not smooth all texture. If you remove all texture from someone’s skin, that person ends up looking like a plastic mannequin. While Portraiture might smooth out the skin on a cheekbone very nicely, it might also leave a few pores visible beneath a subject’s eyes to preserve a realistic look. In addition to smoothing skin tones overall, Portraiture does an excellent job of reducing deep lines and wrinkles. Portraiture’s interface provides a nice big preview with easy-to-use before and after controls, and a comprehensive list of presets that provide everything from minimal modification to a fairly radical high-fashion look. For most users, these presets will probably provide all of the functionality they need. Fortunately, Imagenomic knows that boilerplate solutions aren’t the best for everyone, so there’s a full set of tools for tweaking and customizing. Start with a preset you like, and then adjust it with the simple slider controls, and you can most likely get precisely the amount of effect that you want. And, of course, you can save these new settings as a preset of your own. 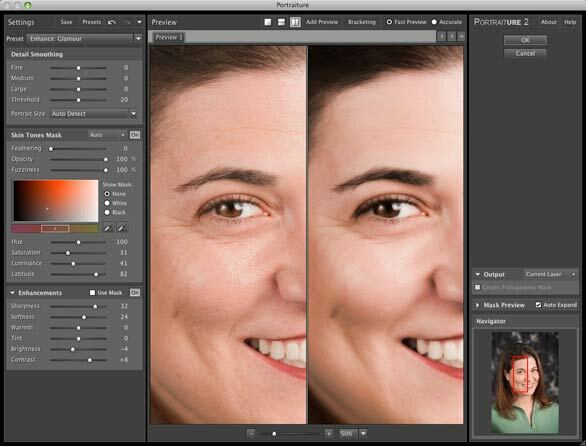 Portraiture’s single dialog box provides all the controls you need to achieve professional-quality skin retouching. Portraiture works its effect by automatically generating a mask for your image, based on skin tone. You can tweak the skin tone color that is used to define the mask, making it simple to alter the plug-in for different ethnicities and complexions. Portraiture also offers some basic image editing controls, such as Warmth, Tint, Brightness, and Contrast. These tools allow you to improve the color rendering of skin tone, to whiten teeth, and to conceal stray hairs and eyelashes. Because you can store these settings in your Portraiture presets, it’s easy to get uniform tone and contrast adjustments across a series of images. Imagenomic has included some cool interface features in the plug-in. For instance, you can “bracket” any parameter you choose, which provides a simple way to zero in on the right amount for a specific setting. I was very impressed with Portraiture’s results, whether I was creating a very pronounced adjustment or going for something a little more subtle. However, as you apply beefier effects, you may notice a strange grainy artifact effect on your image. Personally, I didn’t find that these artifacts were apparent in print. If you shoot even a moderate number of portraits, Portraiture 2.0 will quickly pay for itself by saving time and making your clients happy.